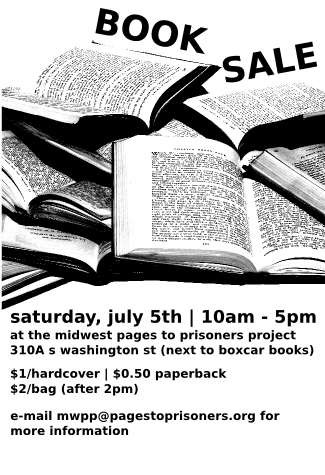 book sale @ the midwest pages to prisoners project. 10a-5p. the midwest pages to prisoners project is moving to a smaller space!Â as a result we need to downsize our collection by selling duplicate copies or books that are rarely requested by the incarcerated people that we serve.Â prices will be $1/hardcover, $0.50/paperback, andÂ after 2pm, $2 for whatever you can fit in a bag.Â all proceeds from this sale benefit our continued efforts of sending free books to incarcerated people. e-mail mwpp@pagestoprisoners.org for more information.